What a boring weather forecast for most of this week! That's not necessarily a bad thing, of course. I just wish temperatures were 5 to 10 degrees warmer, making it feel more like early-to-mid December. A massive storm system dumped a foot of snow and significant ice over Virginia and North Carolina this weekend. It was amazing to watch radar, as the extreme northernmost band just barely kissed Cape May, New Jersey. Aside from thick clouds and a few snowflakes south of exit 4 on the Garden State Parkway, we escaped scot-free from this powerful winter storm. Barely. While most of New Jersey will see spectacularly sunshine Monday, clouds have been slower to clear along the southern coast. It's going to be a chilly and dry start to the workweek, with a light breeze up to 15 mph. High temperatures will only make it to around 40 degrees — warmer than the weekend, but cooler than seasonal norms. With the holy trinity of clear skies, dry air, and light winds, Monday night will be cold. I expect most temperatures to dip into the lower to mid 20s, with teens likely in NW NJ and the Pine Barrens. Tuesday will practically be a "copy and paste" forecast. Sunny skies. Highs around 40. Broken record. 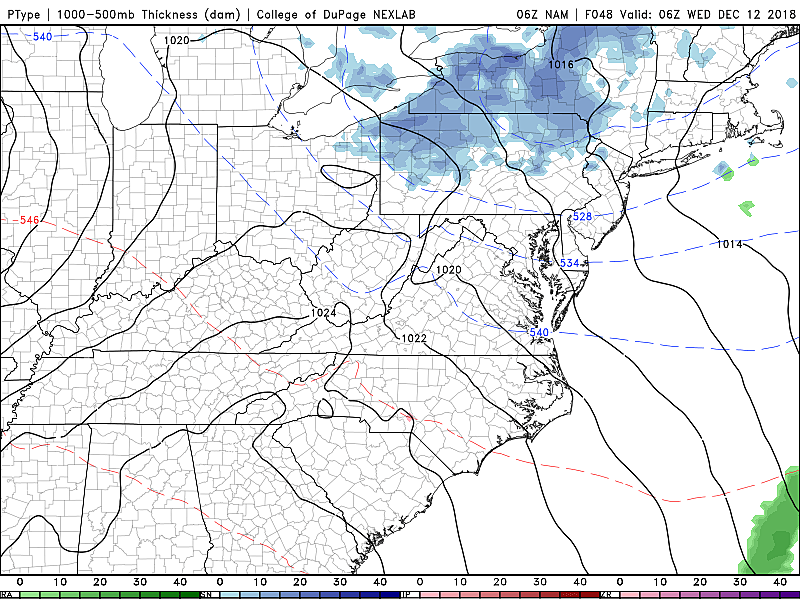 A weak front will blow some cloud cover and flurries toward New Jersey early Wednesday morning. How far south those snowflakes will reach is anyone's guess. I suppose I'll mention a potential dusting of snow accumulation in the northwest corner of the state, but that's pushing it. The rest of Wednesday will feature mostly to partly sunny skies, with highs in the lower 40s. You'll start to notice some subtle weather changes in the second half of the week. Thursday will bring a mix of sun and clouds. More importantly, temperatures will (finally) moderate to near-seasonable levels. My high temperature forecast currently calls for mid to upper 40s. Friday will be mostly cloudy. And, with a light southeasterly breeze, the warmup should continue. High temps should push into the 50s for all but far northern New Jersey. As you might guess, the aforementioned warmup is a very important aspect to this storm forecast. (In fact, highs on Saturday could come close to 60 degrees.) Therefore, the current forecast paints all rain for New Jersey. So that's it... Case closed... Stick a fork in it... Ignore the forecast for the rest of the week... Done and done... Right??? 1.) Will a shift in the forecast track negate the expected warmup, and force more wintry weather than rain? 2.) Will a shift in storm timing cause a precipitation type transition? 3.) Will perennially colder North Jersey end up cold enough to sustain some wintry weather at some point? 4.) Will the ground be cold enough for a period of freezing rain at onset? 5.) Will there be a flash freeze after the storm — rapidly cooling temperatures that quickly turn liquid puddles to solid ice? 8.) Will there be a coastal flooding threat? So much for a quiet week o' weather, huh? As always, we'll keep you posted as answers to these questions develop, as the storm forecast continues to evolve.